I have this book as well and am looking forward to it. Thanks for sharing your thoughts. Interesting that it is based on a true story. That fact, and the part of the story that focuses on her time working with Dr. Crampton would be what I would find the most interesting. I am not finding myself compelled to go pick this up right away though, which is probably a good thing as I have too many books on my ‘need right now list’ already! I do like to read a book that has some actual true story built into it. This woman really has had an amazing journey. Glad to hear you liked this one. I have it for review as well. I’m looking forward to reading it. Definitely intriguing and a unique storyline. I love books set during the Depression and this one sounds engrossing! Great review! This sounds a bit depressing and a little too real. Knowing it was based on a true story makes me even sadder. fairly depressing though as well. the saving grace may be knowing that the protagonist grows to have a family who knows her well enough to want to immortalize her in writing. Humm this sounded more interesting once I saw that it was based on a true story. I like the time period and like stories of women doing what it takes to survive. 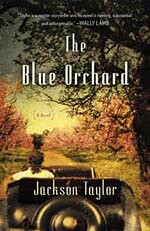 THE BLUE ORCHARD is a page turner with fascinating characters, based on real people in a very real place, that throws light on issues of race and women’s rights and abortion. The story is set in the 1930’s Depression, but it certainly has relevance for our time.